Radnest analyses the true shape, material and thickness of all components in a batch, separating and sorting automatically, producing high utilisation, manufacturable nests from sheets, off-cuts and remnants delivering substantial savings in material and improving machine efficiency. Radnest is a high performance true shape nester for punching and profiling machines supplementing the nesting utilities present in a standard RADAN system, allowing the user to have full control over part placement and nest generation either manually, semi-automatically or fully automatically. Radnest can dramatically increase sheet utilisation and significantly reduce the time taken to create nests. When used with Radprofile, Radnest can automatically produce common line cuts between adjacent parts to further increase material utilisation and reduce cycle time, gaps between components are controlled by the kerf width created by a given material, thickness and cutting method for a specific machine, this data is stored within RADAN meaning that complete automation is possible. Radnest is able to mix different nesting techniques on the same sheet whether that means Rigid Kits, Picking Clusters, Common Cutting or Standard Spaced, the result is industry leading results for today’s modern machinery and manufacturing techniques. 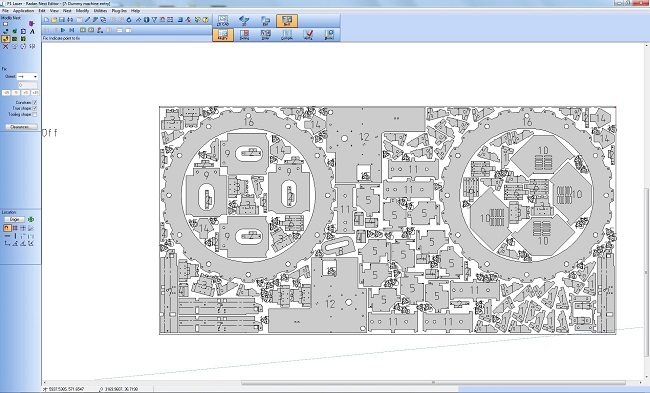 Reading the data stored on RADAN geometry is another way that Radnest improves the accuracy and reliability of nesting within an organisation, RADAN parts can have orientation restrictions, common cutting rules and removal data embedded onto them for any machine tool, Radnest is able to extract this data and use it in context based on the machine the nest is being created for. Radnest enables manufacturing flexibility that is unrivalled in our industry by using the information available to create the best manufacturable nest possible for any punching or profiling machine. Radnest is a fast, modern nesting application designed and written by RADAN to get the absolute best from available options whilst still allowing a human touch when required this is crucial in fast moving ever changing production environments. Radnest uses very modern and complex nesting algorithms to make decisions about parts being nested, the materials available and the machine running the program; to do this effectively it uses all of the computing power available, fully utilising today’s modern multicore processors to get the most cost efficient result in the shortest time.